Workshop Photos & Videos now available! Welcome to the home of the CHI 2011 Workshop “Brain and Body Interfaces: Designing for Meaningful Interaction”. On this page you will find the Call for Participation, Extended Abstract and social media links. Please check back regularly for workshop updates or alternatively you can follow the workshop RSS feed. If you wish to know more about this growing research field check out the Physiological Computing blog FAQ and related posts. Also why not consider joining the Brain and Body Interfaces – Google Group, there you’ll find a welcoming research community ready to discuss the latest ideas, research and going ons in physiological computing systems. You can also visit the Brain and Body Interfaces -Wiki Space for more in-depth technical information (e.g. sensor technology, techniques). The brain and body provide a wealth of information about the physiological, cognitive and emotional state of the user. 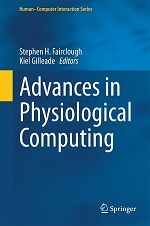 There is an increasing opportunity to use physiological data as a form of input control for computerised systems. As entry level sensors become more cheaper and widespread, physiological interfaces are liable to become more pervasive in our society (e.g., through mobile phones and similar devices). While these signals offer new and exciting mechanisms for the control of interactive systems, the issue of whether these physiological interfaces are appropriate for application and offer the user a meaningful level interaction has been relatively unexplored. The goal of this one-day workshop is to bring together researchers working on brain and body interactive systems in order to (1) provide a platform for understanding physiological interaction in different research strands, (2) establish a forum for the discussion of technologies, techniques and measures, and (3) build and extend the physiological computing community. Use the below links to view individual presentation videos. Workshop photos can be found on our flickr tag. We are located in room 223/224. Each presentation session will be followed by a group Q&A. Let Me Listen to Your Brain – Implicit interaction in Collaborative Music Composition by Sebastian Mealla C.
The design of a sensor at the hardware and software level defines the type of application for which the device is suitable. In medical and psychophysiological research, high-resolution data capture under laboratory conditions is standard. However not every type of physiological computer requires high-fidelity equipment and many of these systems must work in the field. Perhaps the physiological variable that drives the application must be captured with a degree of sensitivity and robustness. The application domain defines the requirements of the sensor and the type of hardware/software support required. In submitting under this topic, we ask researchers to consider how the type of application influences the specification of measures and the required specification for sensor design. For example, a heart rate sensor combined with an accelerometer allows physical effort to be removed from changes in heart rate, allowing cognitive and emotional effects to be processed. A physiological computing system can define the relationship between the changes in a physiological signal and a system command in any number of ways. However, certain relations between the physical and virtual will be more intuitive if they can be made meaningful from the perspective of the user (i.e., a natural interaction). For example, increases and decreases in psychophysiological activation should lead to changes that are both appropriate and intuitive at the interface. In submitting under this topic, we ask researchers to consider what defines a meaningful physiological interaction and what types of meaningful interaction may exist across different categories of physiological computing system (e.g. BCI, telemedicine, affective computing). We also welcome contributions with regard to methods that evaluate meaningful interaction within this context. Physiological data of users are a highly personalised and private source of information. The storage and/or manipulation of these data can pose certain ethical concerns. For example, the uploading of physiological statistics to an online forum outside a medical context may lead to unsubstantiated self-diagnosis. In submitting under this topic, we ask researchers to consider the ethics and privacy issues involved in the storage and/or manipulation of a users physiology (e.g., in biocybernetic adaptive systems) and to what extent should we allow the user’s state to be manipulated? Authors are asked to submit a 4 page position paper in the CHI extended abstracts format to submit (at) physiologicalcomputing.net by 28th January, 2011[Submissions closed]. Papers may describe ongoing work, recent results, or opinions and approaches related to the workshop topic. A short biography of the author(s) attending the workshop needs to be included (100-150 words as a separate document). Papers will be peer-reviewed and the organizing committee will select up to 20 participants according to relevance, quality of results, research diversity, and likelihood for stimulating and contributing to the discussion. If accepted, at least one author must register for the workshop and for one or more days of the conference. Papers will also be compiled on the workshop website. Physiological Computing: increased self-awareness or the fast track to a divided ego?